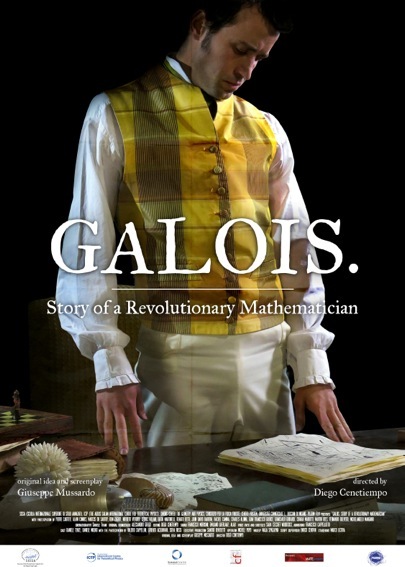 premiere screening of a new film about Évariste Galois. Promo “Galois. Storia di una matematico rivoluzionario” from Diego Cenetiempo on Vimeo. Synopsis: Paris, May 29, 1832. In the middle of the night, on the eve of a duel, Évariste Galois, a little older than twenty, handles for the last time a manuscript full of equations and theorems he had written four years earlier. “I have no time! I do not have time!” he frantically wrote in the margins. Apart from the solution to a famous algebraic problem that has obsessed the minds of great mathematicians for centuries, that manuscript marks the beginning of an extraordinary scientific adventure that radically changed the way we see the world nowadays. Galois has made us aware of the power of symmetry and mathematical beauty, providing us with the ideal language to unveil the fundamental laws of the universe, from the microscopic world of elementary particles studied at CERN in Geneva, to the extraordinary vastness of intergalactic spaces. Genius, rebellious, revolutionary, bitter due to the lack of official recognition, intolerant of injustices, tormented by his father’s suicide, Galois is a romantic heroic character, a figure who seems to come out of the pages of a Victor Hugo or Stendhal’s novel. The tragic history of his life has a fascination that never seems to end. Giuseppe Mussardo (screenplay) is a Professor of Theoretical Physics at SISSA (Trieste) as well as the Director of the Interdisciplinary Laboratory for Natural Sciences and Humanities. He was awarded the 2013 Prize of the Società Italiana di Fisica for Outreach and public dissemination. Kramers Chair for the academic year 2017/2018 at the University of Utrecht (The Netherlands). He is also interested in the history of science and in creating more public awareness about it. He is the author of several articles on the history of science and has delivered many public lectures. He is also the author of the documentary movies Boltzmann, The Genius of Disorder, Chandra, The Journey of a Star, Abdus Salam, The Dream of Symmetry, Maksimovič, and The Story of Bruno Pontecorvo. Diego Cenetiempo (Director) began as a screenwriter, then soon started his career as a Director, directing several documentaries, video promo and short movies. Among them: Wrong Italians, The Tales of Those Who Stayed, Abdus Salam, The Dream of Symmetry, Far Away Is Home, The Story of Clely, Maksimovič, The Story of Bruno Pontecorvo, and Me and Myself. Since 2006 he is a member at Centro Ricerche e Sperimentazioni Cinematografiche e Audiovisive La Cappella Underground. In 2008 he founded the movie production company Pilgrim Film.